Kincheloe Point, the northeast section of Bayocean Peninsula, was named after a man who drowned while taking soundings of the bar at the mouth of Tillamook Bay for the U.S. Coast Survey on May 20, 1867. Sketches of the Pacific Coast had been drawn by the earliest of mariners, but they were so imprecise as to make port entries hazardous. Once California, Oregon, and Washington had been brought into the United States, the Superintendent of the U.S. Coast Survey sent "assistants" to draw accurate charts and make shipping safer along the West Coast. When the first assistants arrived in San Francisco in 1849, they surveyed the most critical ports - like San Francisco, Astoria, and Seattle - first. As years went by they hired "sub-assistants" to fill in the gaps. 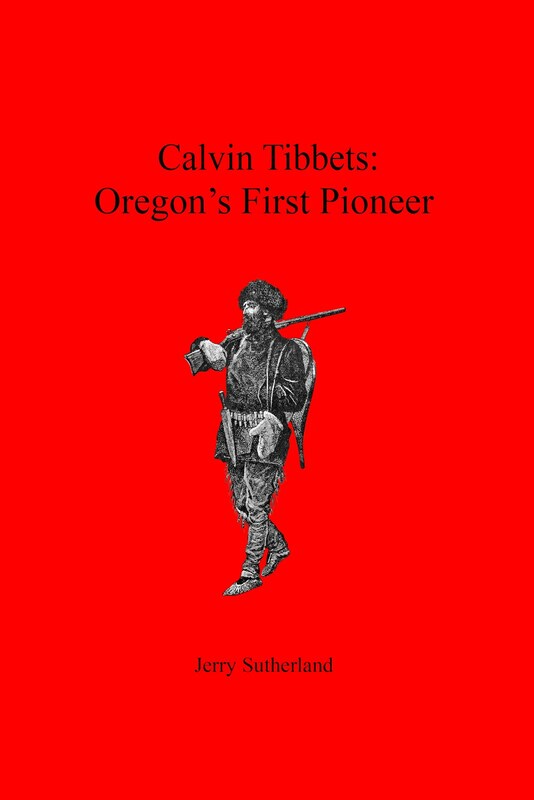 In an autobiography, Assistant Superintendent James Lawson , Kincheloe's supervisor, said that he and his wife arrived in Tillamook in June of 1866. He hired locals Charles West, Samuel Lanagan, Henry Ballou, Beveriah Steelcup, and Elias Steelcup to assist him and started establishing precise geographic coordinates. Later, they took soundings to map out Tillamook Bay's hydrography. In the Obituary and Section XI of his 1867 report, Superintendent Benjamin Peirce said that after eleven months Kincheloe's work was mostly complete; he was just waiting for calm seas to get a couple final soundings to create a "concluding line across the bar." Opportunity came May 20, when "the channel was perfectly smooth...not a ruffle on its surface" according to a story in Oregon City's Weekly Enterprise . Kincheloe and his five men had finished, and were heading back when a breaker swamped the boat. Before they could recover (due to the anchor falling out) another one capsized it, and others washed them overboard. The only man to hang on and survive was James Steel. On May 8, 1902 T.B. Handley was prompted by the drowning of the Steelcup brothers' nephew Fred to write about the Kincheloe event in the Tillamook Herald. Steel was saved by a boy named Duvall Clark (Pierce called him George Clark, Jr.). His family was living at what's now Barview, so he could see what was happening. He headed out in a small canoe "despite the entreaties and commands of his frightened mother." In the meantime, Daniel Bayley (at whose home the Kincheloe's were staying; his land claim was to become Garibaldi) hired four Indians from a nearby village, who relieved Duvall from pulling Steele behind him (to avoid swamping the little canoe) against a heavy outgoing current. Superintendent Peirce said that, "On July 1st the bodies of Sub-Assistant Kincheloe and Elias N. Steelcup, one of the crew, were found at a point on the coast about fourteen miles distant from Tillamook Bar." Bodies of the others were never recovered. The Herald reported that Ballou was survived by a wife and child, implying the rest were bachelors. At Neah Bay, James Lawson heard the news from a passing ship and went to Olympia where he received orders (as expected) via telegraph to proceed to Tillamook. 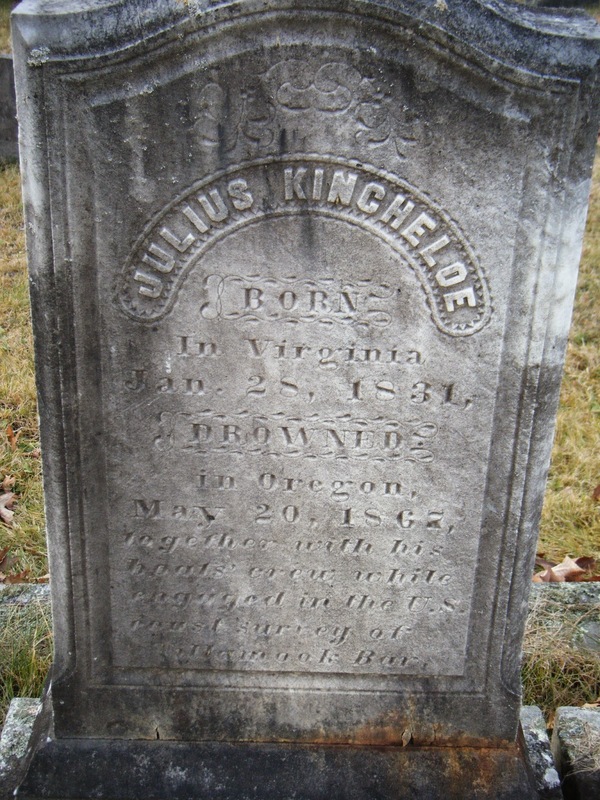 When he arrived he found Mrs. (Jennie) Kincheloe " in great distress." No wonder: she'd watched the entire event from shore, wrote a final report for her husband, and then (according to Handley) "went to bed and was prematurely [sic]delivered of a stilborn [sic] child." 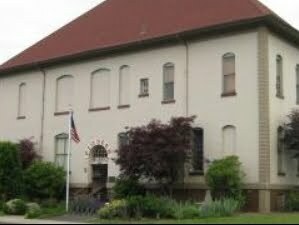 While waiting for Captain Flavel to send a schooner to retrieve them, Mrs. (Cecilia) Bayley nursed Mrs. Kincheloe to the point she could travel to Astoria, where Mrs. Flavel took over. Lawson then accompanied her on a passenger steamer to San Francisco, from where she sailed back home in Maine. 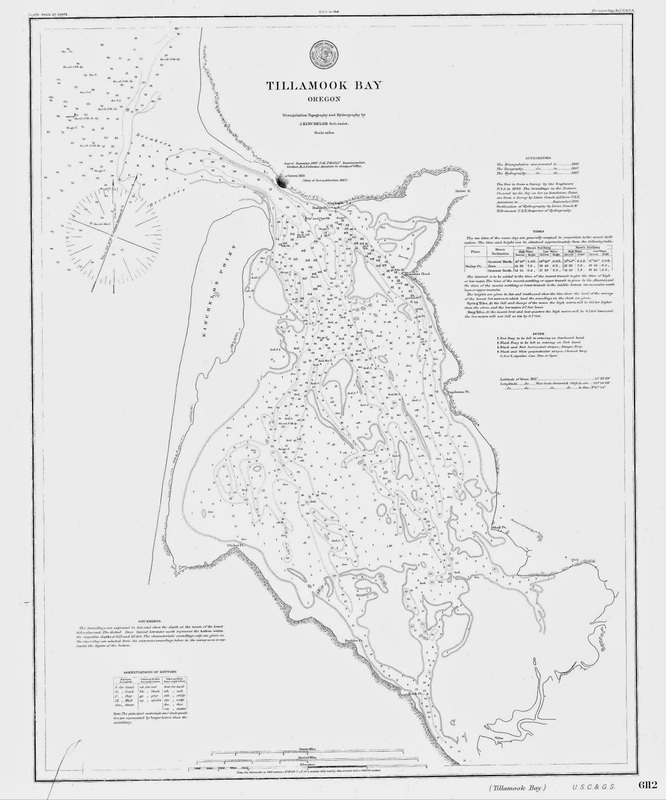 The first Coast Survey chart of Tillamook Bay was published in 1869 along with the superintendent's 1867 report. It was credited to Kincheloe but left the spit unnamed. When Superintendent F.M. Thorne updated the chart in 1887, he named the spit Kincheloe Point. This honor had been preceded by a Coast Survey ship being christened the Kincheloe in 1876. As discussed in Stand Under Bayocean Hotel, a survey control station was named after Kincheloe in 1926. All the men who drowned that day are listed at the Coast Survey's In the Line of Duty web page. The Corps of Engineers and the Coast Survey both referred to the entire spit as Kincheloe Point until long after Bayocean was built. It wasn't until Bayocean was washed to sea that the name Kincheloe Point was relegated to just the northeast corner of the spit. Before the levies were built, the narrow spot between Kincheloe Point and Green Hill was the mouth of Tillamook Bay. Reports of the drowning said the bar was about 1 1/4 miles out from there, which would be near the end of the current jetties. The Tillamook Bar continues to be "one of the most treacherous bars on the Oregon coast" according to the U. S. Coast Guard Tillamook Bay web site. A 2010 story in the Oregonian titled "Tillamook Bay bar grows more deadly, claiming 17 lives in seven years" explains why. The drowning of Sub-Assistant Kincheloe and his crew was an unfortunate harbinger of things to come.